Heidi Kegley speaks to the Delaware City Schools Board of Education after being chosen as the new superintendent Monday evening. Kegley will officially start in the position on Aug. 1. 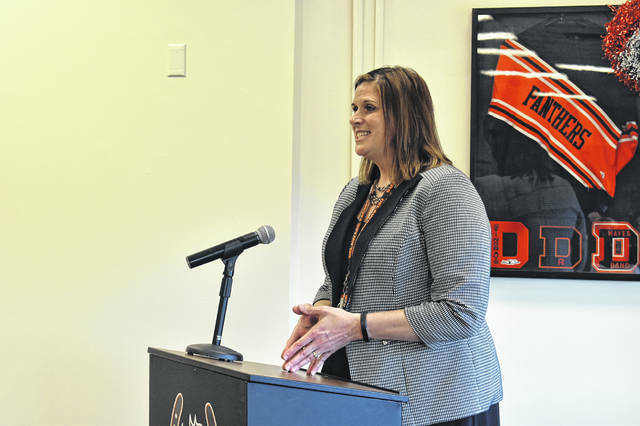 The Delaware City Schools Board of Education named Heidi Kegley as the school district’s next superintendent during Monday’s board meeting, filling a vacancy after Superintendent Paul Craft announced his departure last month. The decision was announced after a brief executive session following the regular meeting. Kegley will assume the duties of superintendent on Aug. 1, replacing Craft, who is leaving the job after accepting a position with META Solutions. Kegley was unanimously approved by the board. Kegley has been with the district since 2003. Currently the district’s assistant superintendent, she previously held the position of principal at Willis Intermediate School. Kegley earned a bachelor’s degree from Wright State University and her master’s degree from the University of Dayton. She completed her principal licensure at Ashland University and her superintendent’s coursework at Miami University. She is married to Jack Kegley, and their twin sons, Kyle and Tyler, are in their freshman years of college. After the announcement, Kegley thanked the board and Craft. Craft said the board made a great decision, and appointing Kegley is one of the best decisions the board has ever made, even better than the decision to hire him. Additionally, the board approved several other staffing changes during the meeting, including accepting the resignations of Craft, who will end his term with the district on July 31; Kaitlyn Barnes, a teacher at Woodward Elementary; Andrew Borzok, a teacher at Hayes High School; Katie Gries, a teacher at Conger Elementary School; and Hannah Wiegmann, a teacher at Dempsey. The board also approved contracts for various administrators, including Hayes Principal Richard Stranges, Dempsey Principal Daniel Bartha, Smith Elementary Principal Rochelle Thompson, Director of Special Education Angela Macwhinney, Director of Food Service Sally Rathje, Transportation Supervisor Edgar Rice, and Director of Communications Jennifer Ruhe. The board will meet next at 6 p.m. May 6 in the board room at the Willis Education Center.